A carton dispenser of bubble wrap cushioning. Regular and expandable cellulose wadding for product cushioning. Rolls of polyethylene foam cushioning wrap for protecting products during shipment. Rolls of corrugated cardboard wrap for cushioning products during shipment. Recycled, heat sealable, foam pouch envelopes to insert products for protection during shipment. 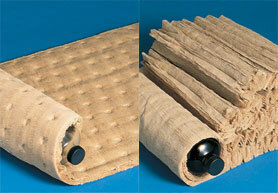 Corrugated cardboard sheeting for product cushioning. A system for using Instapak® expanding foam to cushion products for shipping.